In modern horror, subversion has become the new cliché. Since Wes Craven’s Scream ushered in the 21st century of horror, the genre’s default setting has become self aware. And even if the characters aren’t riffing self effacing one liners, the films all expect their viewers to come to the table with a grip of genre knowledge. And for every brilliant Cabin In the Woods, there are a hundred Mad Libs style horror films, seemingly content to shuffle around familiar pieces in different shapes. The Dark definitely engages in its fair share of convention shuffling, but the results are surprisingly compelling. Few first-time directors are able to turn their love of the genre into a decent film and fewer still do it with such a masterfully rich and disturbingly dark tone. The film kicks off when a wanted man named Joseph (Karl Markovics) finds his way to a secluded house in the middle of a stretch of woods known for being haunted. He’s dispatched as quickly as he arrives by a hooded killer we soon learn is Mina (Nadia Alexander), an undead recluse who kills anyone who gets too close to her childhood home. Nadia’s is comfortable killing trespassers, but when she finds a blind, physically abused boy named Alex (Toby Nichols) hiding in the back of Joseph’s car, she doesn’t know what to do. The two strike up an unlikely friendship as the search for Alex brings more and more people to her woods, threatening to change her way of life forever. There are any number of reasons why The Dark shouldn’t work. It’s plot is a contrived collection of genre routines and the absence of a larger budget only serves to shine a light on its structural deficiencies. But here’s the thing, The Dark does work. It works pretty well. And it works because of an unwavering commitment to a tone that no big budget studio would ever green-light. First-time director Justin P. Lange has unflinchingly combined the three things that make people uncomfortable: children, violence, and humor. 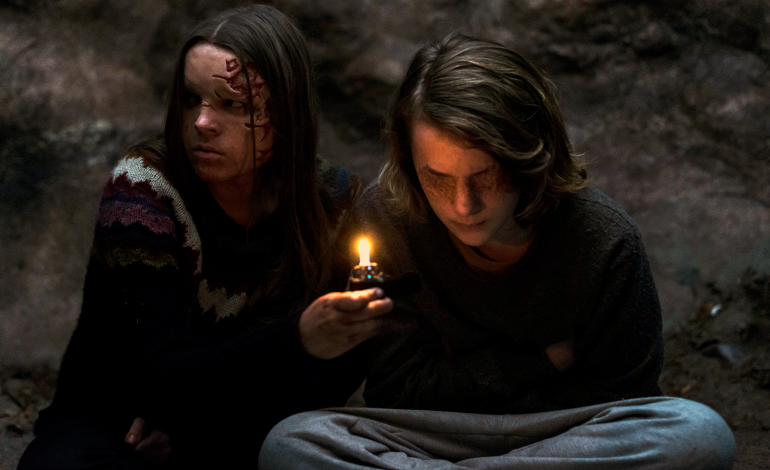 The Dark has a pitch black sense of humor, which is par for the course in modern horror, but the film plays itself entirely straight. The word zombie is never once uttered and the film seems entirely uninterested in commenting on the conventions it swims through. Even more interesting for a film planted securely in the horror comedy camp, none of the violence is played for laughs. Now, it’s unusual for every scene of violence in a film to feature a child. It’s even more uncommon for the child to be the perpetrator of that violence, and when they are, it’s almost always for comedic effect. It’s a gutsy move for Lange to allow Mina, the child protagonist of the film, to engage in numerous acts of brutal carnage on ordinary, decent people. It’s a big gamble that works, thanks largely to a breakout performance by Nadia Alexander, who imbues Mina with empathy and dangerous edge. While Mina is the film’s great success, Alex is more of a mixed bag. The young Toby Nichols provides Alex with a ferocious fragility that borders on dangerous and his propensity towards Stockholm Syndrome is crucial to the film, but too much of his psychological damage is left unexplored and unsaid. Lange’s script attempts to make a mystery box out of Alex, but his backstory is easy to infer and serves only as a meaningly distraction to what is otherwise a narratively taught film. The Dark is proof that the power of a story is in the telling. The Dark might be assembled from familiar pieces, but it’s told in a way that feels entirely new. It belongs to a postmodern class of horror films, but it’s not defined by its awareness of the genre. The film is as earnest as it is dark, and it’s nice to see a film not undercut its own drama by winking at itself. Lange is a talent to watch. If you can, check out The Dark at the Tribeca Film Festival where the film is making its world debut. Genre fans should make sure they don’t miss it.